Mughal painting came into its own under Emperor Akbar (r. 1556-1605) with historical scenes such as this. The events Akbar thought most suitable for immortalization in a miniature were often battles and births, for they were not only momentous and lively occasions, but also what most made an empire. 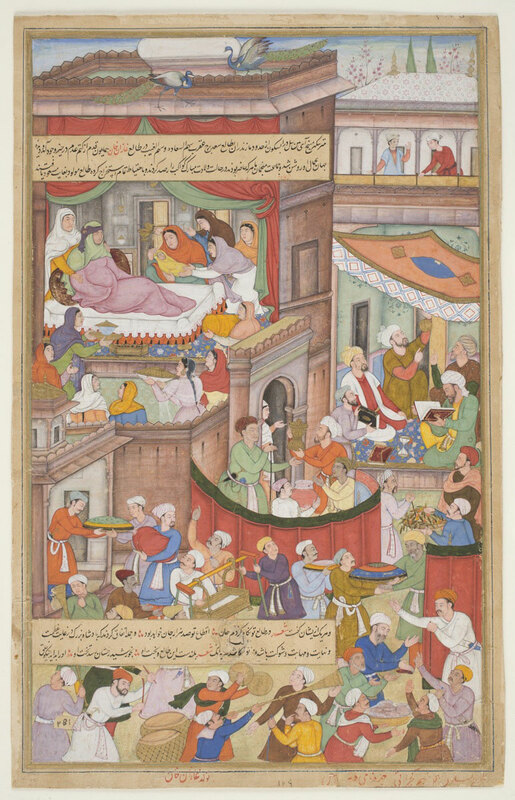 This painting depicts the birth of Ghazan Khan (r. 1295-1304), son of Arghoun Khan (r. 1284-1291), a Mongol sultan of Persia. With manuscripts such as this, Akbar sought to illustrate his noble heritage and further legitimate his rule. The Jami-al-Tawarikh manuscript was originally commissioned by Ghazan Khan's successor, Ulijaytu (r. 1304-1316) as a general history of the world as it was known by the Mongol court. The first of its four volumes, from which this probably comes, was a record of monumental events in the history of the Turk and Mongol tribes. All three artists who worked on this miniature were leading court painters under Akbar, but the greatest was Basawan, one of the emperor's two most esteemed Indian masters. Basawan is especially noted for compositions that explore the effects of deep space: he moves the viewer's eye from one vibrant center of activity to another. Basawan's figures, moreover, are well-rounded, giving a strong sense of substance under their ample clothing, and they are enhanced by lively and flamboyant gestures and brilliant colors. As in many paintings from the Akbar period, each figure depicted here is an individual, with his character shown most prominently in the rendering of face and posture.